Believed to be a port used by Sir Francis Drake in the seventeenth century and location of one of the British pirate's fabled hidden treasures, Drake is one of the most remote and primal tourist destinations in Costa Rica. The town of Agujitas (Drake) has a population of about 1,000 residents, and tourism is the economic base of the community. Drake is not on the beaten track and can only be reached by highway during the dry season. Boat service up the Sierpe River and air travel connect Drake to the rest of the world during the rainy season. There are miles and miles of beautiful coastline with rocky crags and sandy coves that extend from Agujitas Bay, where the village of Drake is located southward toward the boundary of Corcovado National Park about 12 miles to the south. Along this stretch of beach are located some of the most remote and spectacular ecolodges in Costa Rica. All of these all-inclusive destinations require boat transport, which is provided by the lodges for their guests. Drake Bay offers lodges and hotels for fishing enthusiasts, nature buffs and anyone looking for adventure. 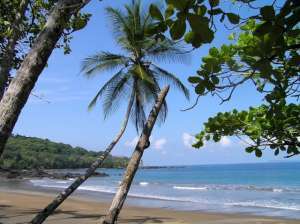 Drake Bay is also the starting point for many other adventures on the south Pacific of Costa Rica. Scuba diving near Isla Del Cano is a marvelous experience where you will see a diverse marine life and an amazing under water scenery. The area is the destination of humpback whales from September to January, and you can decide to go on one of the amazing whale and dolphin watching tours from your hotel. With world-class fishing and several fishing records in the area, it is certainly a one of a kind experience. You can lodge in one of the exclusive fishing hotels where you can meet with other enthusiasts, or stay at a hotel closer to the Corcovado National Park to explore the wilderness. Corcovado has an immense biological diversity which still exists because of its remoteness and the fact that most of the National Park has suffered relatively little disturbance by humans in the past.